You've probably already fallen in love with these first six songs recorded for Young Life by the Nashville Nine. It's an anonymous group of Young Life musicians who are committed to writing and recording content songs for us to use in club. As a gift to the mission, here are two brand new ones! The first is called "Rescue." I love it! It can fit well in club all semester long. I think the best time to introduce it might be on the night of the need talk. When you first play the song, leave out the 'alternate chorus.' Just delete that section from the slides below and replace it with the original chorus. Later on in the semester, maybe after the cross talk is given, sing the song with the alternate chorus. "You are the rescue" instead of "I need a rescue." This song works great with a response talk and could fit well later in the semester. It also would fit perfectly if the talk is on the Prodigal Son. 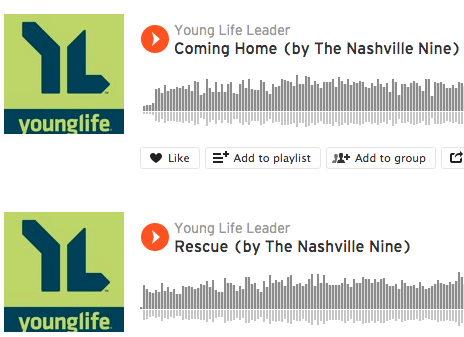 Download the other Nashville Nine content songs here.